The Natural Land Institute purchased the 80-acre Pecatonica Ridge Prairie Preserve at auction in June 2005. The preserve includes an eight-acre gem of original native prairie at the south end with species that include pasque flower, pale purple coneflower, rosinweed, porcupine grass and prairie dropseed. Plants such as joe pye weed and tussock sedge grow in the 40 acres of wetland at the north end of the preserve. Approximately 32 acres between the prairie and wetland were planted in corn and soybeans for many years. In 2005, NLI volunteers and staff began collecting native prairie seed to restore vegetation to the area. In April 2006, kids and volunteers restored two acres adjacent to the original prairie remnant by broadcasting a mix of the seed. Seed collecting and planting by volunteers continued until the restoration was completed in the spring of 2009. 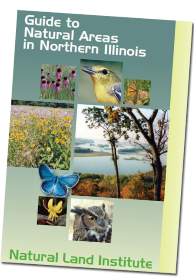 Native prairies are rare in Illinois. Pecatonica Ridge Prairie is one of about 250 fragments scattered throughout the state. Each is a natural treasure.